It is difficult to comprehend the totality of Hinduism in a glance. When you minutely view its various aspects, its beliefs and practices may look overwhelming and even contradictory. Many people find fault with it because of their ignorance or lack of proper understanding. However, when you view them from a higher ground with the wisdom of a yogi they may represent a unified vision of the same universal truth manifesting variously to meet the diverse spiritual needs and aspirations of people in various stages of spiritual progress. In Hinduism, therefore, believers learn through experience and realize that truth is relative to the point of view and the source of our differences and all the quarrels about its eternal wisdom is essentially about the way we look at it and understand it. 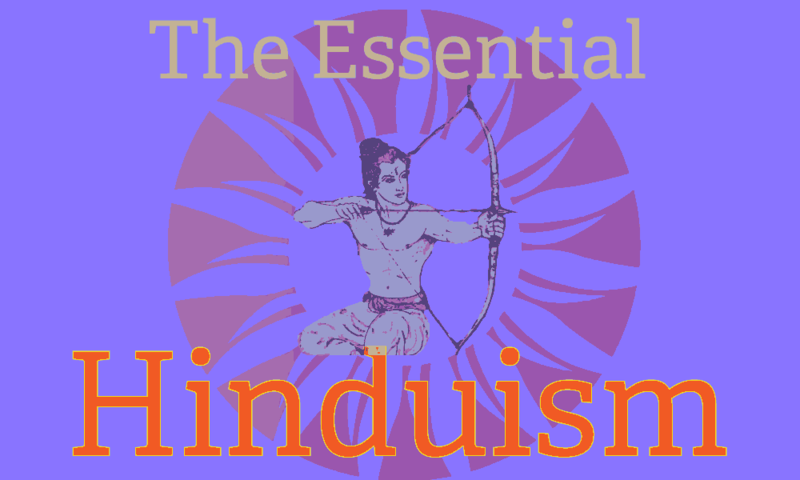 In this section we have presented a few important beliefs, practices and concepts of the essential Hinduism for your general understanding. We have presented here the purpose of rituals, the types of rituals performed by devout Hindus, the duties of householders in their day to day lives and more. Find here the list of original essays on dharma or dhamma from Hinduism, Buddhism and Jainism available at Hinduwebsite.com. The Hindu concept of world as an illusion is explained here. Hindus believe that the world around is not real because it is ever changing and unstable. How to overcome this illusion and realize the truth beyond is the essence of all spiritual endeavor in Hinduism. The essay describes the symbolism of Brahma Chakra as the Wheel of Life and Death (Kala) and compares it with the Kalachakra of Buddhism. A comprehensive essay on the sacraments of Hindu tradition. A must read if you want to know the practical aspects of Hindu way of life. The Hindus do not believe in just one heaven or one hell, but in many that exist at various levels of creation. Depending upon ones deeds one goes to either the heavens or the hells as a part of his spiritual evolution. Read more of this in this article. According to Hindu scriptures at the center of man is Atman and encircling it are five different sheaths or bodies. Know about these five sheaths of human personality in this article. Yajna or yajna is an outer form of worship in which offerings are made to different deities in a prescribed and systematic manner by qualified priests to supplicate them, so that they would assist the worshipper in achieving certain results in life. The significance of yajna is discussed in this article. The 24 principles of manifest creation from the Sankhya school of Philosophy are described in this essay. The Vedic rites are performed during various stages in the life of a human being for various purposes. Some important Hindu rites are explained here. Animals occupy an important place in Hinduism. They are frequently mentioned in Hindu myths and legends and enjoy a place of their own in Hindu pantheon as vehicles of many gods and goddesses, as divinities and also as incarnations or aspects of Vishnu or Siva. Annam means food. According to Hindu scriptures, annam is a form of Brahman (annam parabrahma swaroopam). We are told that even gods do not have a proper understanding of the Truth about Brahman. The difficulty in understanding and knowing Brahman is discussed in this article. A husband and wife on earthly plane symbolically represent the same relationship that exists at the universal levels between the Purusha and Prakriti. Know more from here about this relationship. Puja is form of symbolic worship of God by man. Puja is very much an ancient tradition of Hindus. According to Hindu mythology even the gods perform puja to propitiate higher planes of divine beings. Know in detail the meaning and significance of this Hindu form of divine worship.